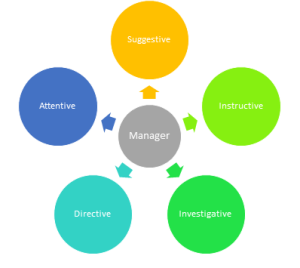 Experts have identified numerous styles to describe a variety of management methods including, management by objective, management by walking around, and management by exception, just to name a few. Management by adaptation offers another viewpoint. Management by adaptation recognizes that each leader has their own set of strengths and doesn’t try to change those core strengths. Instead, management by adaptation allows leaders to stay true to themselves while creating an environment that allows their team to thrive as well. This concept allows people to embrace their signature leadership style and still adapt to meet people where they are. For a performance-based organization this means focusing on the needs of your team members according to their skill level and attitude and modifying your management style to meet their needs. There are basically three types of people in the workplace when it comes to career development – climbers, sliders, and middlers. The term climber refers to someone who is climbing the corporate ladder. Climbers have great attitudes and may or may not have a high skill level and they are interested in career growth. A slider is someone who is going backwards. Sliders have poor attitudes and may have either a high or low skill level. They may have been interested in career development at one point but have become disengaged. Middlers are holding steady right in between. They come to work and perform their work well, are typically easy to get along with, and have little to no interest in career development. Managing for skill development. Use this style when working with someone who has a good attitude but low skill level. Their skill level may be low because they are new on the job and are still learning. Or maybe they have just been promoted into a new position with a different skill set. Assume an instructive style with this person which is heavy on telling and light on asking. Managing for growth. This team member has both a good attitude and a high skill level. There is a high potential for future growth and your job is to prepare them for their next opportunity. It may mean delegating tasks that you like to do in order to help them develop skills to reach the next level. Take a suggestive approach with this person. Do more asking and less telling. Managing for growth and improvement. This employee is low in attitude but high in skill. They are probably disengaged and may be looking for a new job. This can be a tricky one. You have to manage to attitude, which could be caused by a lack of opportunity or boredom, and at the same time have a career development discussion. Take an investigative approach with this person. Start by asking to get information then move to telling. Managing for performance improvement. This person is deficient in both attitude and skill. Managing this person requires a frank discussion about where they are at and where they need to be. Sometimes it means an open discussion about whether not the person is in the right job. This requires a directive approach which requires specifically telling the person what is expected. Managing for maintenance. Use this style for middlers, those who enjoy their work and do a good job. Be careful to not ignore them because they are easy. They are an extremely valuable part of the team and you want them to stick around. Use an attentive approach to ensure that they are not forgotten. In all cases, a direct communication style will provide the best results. In no case does vagueness play a role. I ask a lot of people the question ‘What makes a good leader?’ and not once has anyone given the response ‘A good leader is someone who beats around the bush’. In fact the opposite is true. People respect a leader who gives clear direction and feedback. Managing by adaptation is just the right model for performance-based organizations because it provides clear direction and support to help individuals get to where they need to be. ← Is that opportunity knocking?